An important milestone in a city’s successful city of culture bid was marked with a regional daily running a front page wrap. 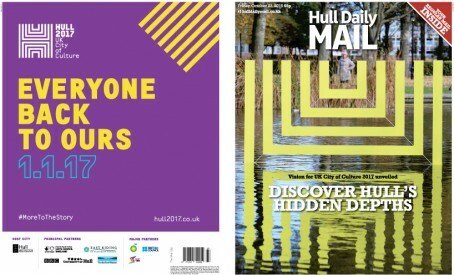 The Hull Daily Mail printed the wraparound on Friday, as the city prepares to become UK City of Culture in 2017. The newspaper ran announcements about vision, branding and collaboration for the accolade. The cover image, below, features the new Hull City of Culture logo which is a steel sculpture of half an H, which has been installed in a pond in Queens Gardens, in the city centre. The reflection ‘mirrors’ the second half of the H.
The Mail supported Hull’s bid since it first announced it would run for the accolade. Editor Neil Hodgkinson said: “We have been involved in the City of Culture process at the sharp end since day one. “It will be a great time for the city and a real gee-up for the people who live and work here. And guess where the logo, representing the talents and culture of Hull was designed……. Sheffield of course!